Off-late Payeng and I have been planning for completing some long pending test rides, but I was always falling short of time. Finally got a chance yesterday and we both decided to go for Yamaha this time. 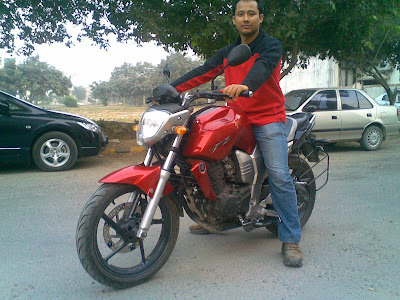 We both went to the Yamaha Pick Up Station at Shushant Lok 1, Gurgaon. No sooner I parked my bike outside the show-room, the R15 and FZ16 standing outside the show-room suggested that they would just serve the purpose we had in mind. So let's start with the latest addition to the Yamaha stable - the Yamaha FZ 16. A lot has been discussed about the bike's looks and overall aesthetics of the bike.... and why not!! This is easily on of the most gorgeous looking bike available in India be it any segment. From the front to tail, the entire bike has been designed with looks in mind and I guess that's the only reason for it's HUGE 140/60-R1 7 cross section tyres which is probably the biggest in any segment of bike (not including the Yamaha R1 and the Yamaha MT01) available in India. To start with the riding experience as soon as to push the ignition of the bike, it jumps to life only to settle down to a smooth 1k rpm base engine note, relaxed and at ease. The riding posture of the bike is more of a tourer as opposed to most of the up-coming and existing 150cc machines available in market. It's upright and relaxed. The design of the seat also complements this posture but providing a lot of cushion to the back. 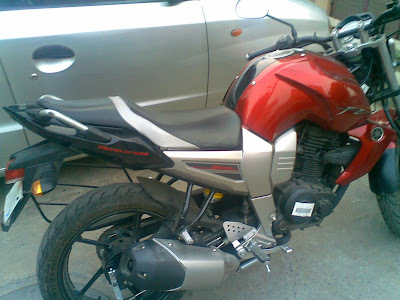 Do keep in mind that when I'm saying that the sitting posture of the bike is a tourer class I'm certainly saying that the sitting posture is of the class of our 100cc commuter and neither it's like the class of Bajaj Avenger. It's somewhere in between. A lot more comfortable and full of confidence. The bike produces a whooping torque of 14 N.m @ 6000 rpm and it quickly proves it as soon as you try to let the clutch go in first gear. The bike is very eager to move and keep on moving. The low level torque is good but the mid range torque, when the bike is at 3 gear and either your are going low on speed or trying to pull a bit harder, the bike seemed to make an effort for both. Again, since we were riding a test bike, a brand new bike might behave entirely differently. The pickup of the bike is awesome and the handling too. The sitting posture again complements the handling coupled by it's extra fat rear wheel. I turning radius of the bike was also small and cornering was very precise if I was at 2nd gear. 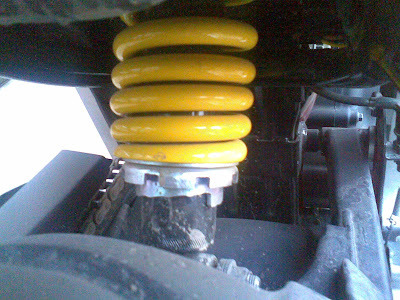 The braking was spot on and the front shock absorbers did a wonderful job. They were neither too rigid nor too soft. Just perfect. The strip on which I was testing the bike was pretty even and smooth therefore was not able to feel much of the enhanced Monocross Suspension, but yes, being a person with acute lower back issues, my back was pretty happy while the bike and that's where I think the Monocross makes it's presence felt. But there were a couple of itsy bitsy thing in the bike which I thought had room for improvement. The very first contender was the "saari guard". Common Yamaha guys, why a saari guard on a bike which is very much close to the FZ 1 concept? Get rid of it. The second thing which I didn't liked that much was the all digi console of the bike. Even though it looks neat and futuristic, but personally speaking I like seeing the analog tacho going crazy at the twist of my wrist. Over all I would say that for city conditions or highway conditions, it's one of the best 150cc machine that's available in the current lot and with the technology that's built in the bike, a 70k+ on road price tag for the bike is worth it. I always considered the Yamaha R 15 is a bit overrated for a 150cc bike and the major USP of the bike is it's front faring. But as the saying goes - "There's more than meets the eye", this holds true for the R 15 too. Being more inclined to Sports bike, the bike is a stunner look wise at first glance. But ya, the excitement does fade out a bit as you continue inspecting the bike and reach it's rear. It seems that the designers of the bike overworked for the front of the bike and by the time they reached the rear, they dozed off. But still the bike is well in proportion and well balanced. The main gem in the chassis of the bike is the ultra light Delta Box frame which not only makes the bike rigid and light, but provides an unparalleled balance to the bike and makes the handling a bliss. The bike which I was testing was pining for service and also had less air pressure in it's rear tyre and therefore the riding experience was a bit over-shadowed by it's condition. As soon as you press the Start button of the bike, it's all ready to rip off the road. Gear engagement is smooth and needs no effort what so ever. The best part what I liked was the pull of the bike in the first gear. It was fast and smooth and the speedo easily went past 15 kmph in the first gear which I think for a 150cc bike is pretty neat. The second gear is comparatively small, but the third and the fourth gear are pretty much cool. The bike produces a torque of 15 N.m @ 7,500 rpm but I felt the revs were a bit lacking. For example, the bike became a bit sluggish when I was at third gear and I deliberately dropped the speed to 15 kmph and tried to pull it back from there. This means to keep the bike zipping, you need to keep the revs high and only then the fun begins. The handling of the bike is just superb, be it at high speed maneuvering or cornering at low speeds. It's simply the best I've ridden so far in India. The big front faring is no obstacle when you are making "O" turns. The bike just moves!! The "slim" rear tyre doesn't pose any problem what so ever and thus there is no compromise in the handling and comfort of the bike. The sitting posture is the sportiest amongst all the lot in India (again not mentioning about the R1 here). I specially liked the arrangement of the clip-on handle bars. 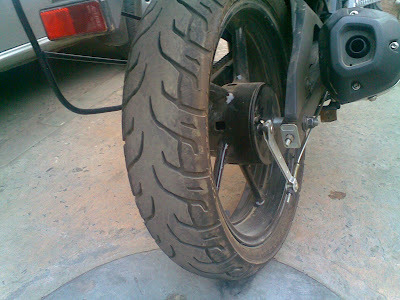 Your hands are very close to each other and that adds to the handling of the overall bike and specially at high speeds. 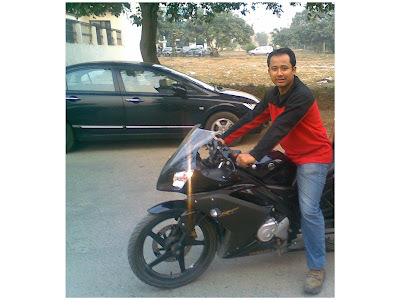 With a water cooled, fuel injected, four valve engine, I've no doubt the bike easily attain speeds of 115 kmph. A 150cc machine producing 17 ps and having a Kerb Weight of 131 kg does have a serious weight-to-power advantage over it's nearest competitors (I guess it gains even over my Pulsar 200 in this respect). The Yamaha guy who was with us for the Test ride claimed that once he went to a speed of 150 kmph on this bike!!! Well I have my reservations against this claim because 150 kmph for a four stroke, single cylinder 150cc seems to sky high. But again, I'm not sure and I might be wrong. The only thing I found missing in the bike was a proper steering damper which would have been a great security addition to a fast moving bike. But overall I would say it's a good strip down version of might R1 as against other claims made by Suzuki and Honda. You are right bro..... Payeng fits both the bikes perfectly!! Yep, both these bikes fit me like a Glove..!! Especially the R15. Thanks for posting my pics Sajal dude. You know what.... it's a great benefit for you that these bikes fit you comfortably!! Infact if you check the records, most of the successfull MoToGP Riders are short or average heighted. It gives them more agility, first to fit into the bike, and secondly to flick and bend the bike with more authority. Gagan Dude and Srindhi Dude!! hey dude,u r absolutely right,u know i never took yamaha bikes seriousaly as it was my thought dat dey r not serious 4 indian customers,but after launching these two bikes(r-15 and fz-16) i was shocked...desgin-look of both bikes xcellent,me and ma cousion purchased both bikes,after using dis v found dat d power performance of both bikes,specialy of fz-16 is gr8...thnx yamaha...guys yamaha hv launched some ultimate models in past also(R1,MT01),jus look on dem on..
Hello I enjoyed the article and I want to invite you take a look at my page to see more of r1 frame.